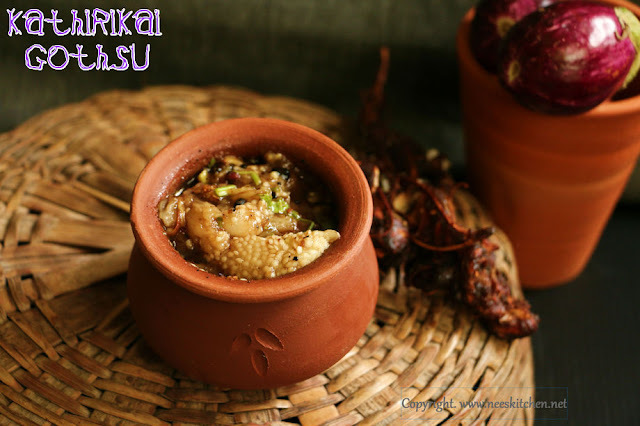 Kathirikai Gotsu | Brinjal Gotsu - no oil , no onion and no garlic. 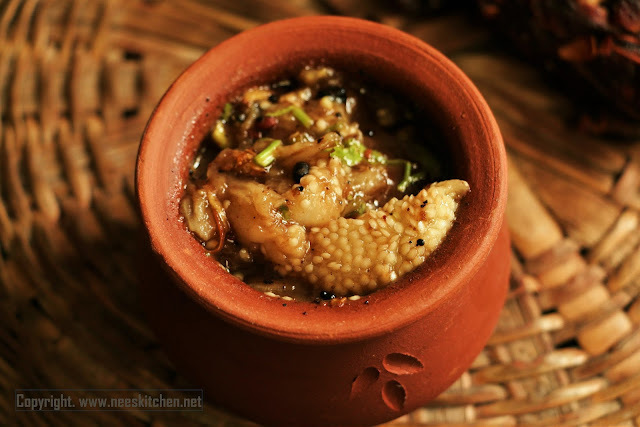 "Kathirikai Gotsu | Brinjal Gotsu" is a quick and easy side dish for Pongal. There are various ways to prepare gotsu and this recipe contains no oil and no onion. Brinjal is roasted directly on fire to get the smoky flavor & combined with tamarind , ginger, green chili & salt. The taste is further enhanced with garnishing of curry leaves and coriander. It is optional to temper this recipe. You may refer to the instructions as they are not available in my video. 2. Place brinjal directly on top of the gas. Allow brinjal to roast over the flame for 10-12 minutes. Keep turning at regular intervals so that they get evenly roasted. The skin should be completely blackened and must be charred. Let it cool down. 3. Once it is at room temperature, remove the skin you would see the flesh being cooked perfectly. 4. Mash the flesh well. 5. Take a heavy bottom vessel and add finely chopped green chili, ginger and curry leaves. 6. Add mashed roasted brinjal. 7. Add tamarind juice, 300ml water, salt & coriander leaves. 9. For tempering (Opitional step), Heat oil in a heavy bottomed vessel, add hing, mustard seeds and as they splutter add urad dhal & Bengal gram dhal. Sauté until the dhal’s turn brown. The roasting of brinjal differs based on the size of brinjals.